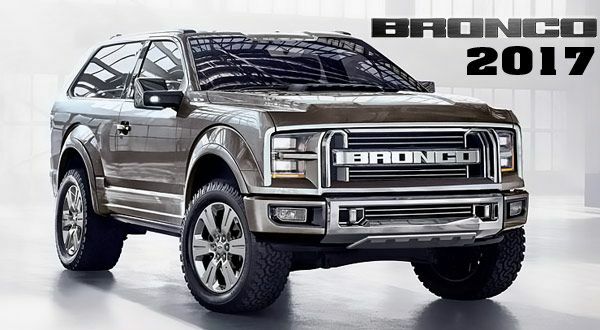 We all have our influences, and when it comes to trucks, we’re usually influenced most by our parents. Many families have a truck because they need to haul supplies and large items. It just makes sense to have a truck around, and they almost always pay for themselves because they get the job—whatever it might be—done. 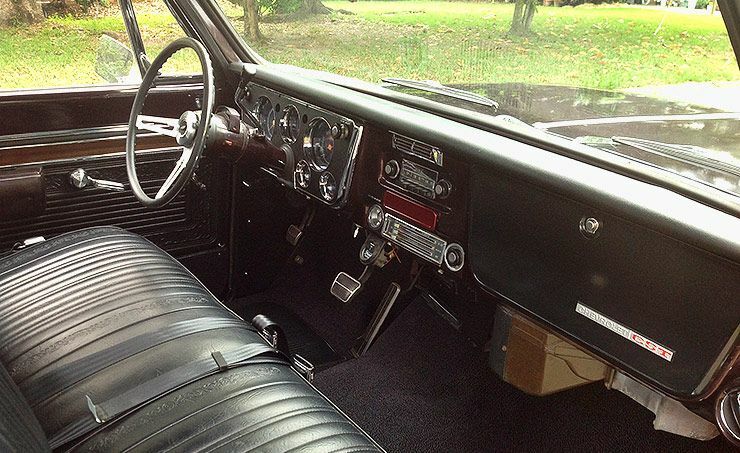 Remembering all of the good times we had as kids riding around in our parents’ trucks can make even the most stoic among us nostalgic for a particular make and model. 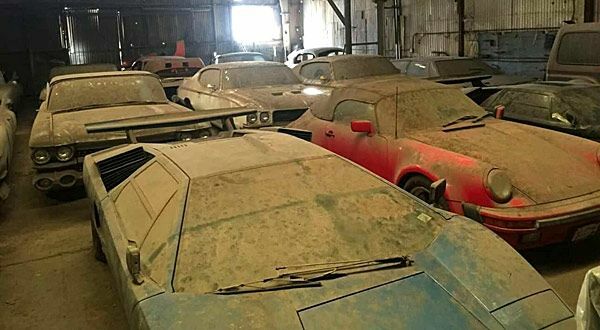 Matt Hyatt felt that way about the trucks his father owned. 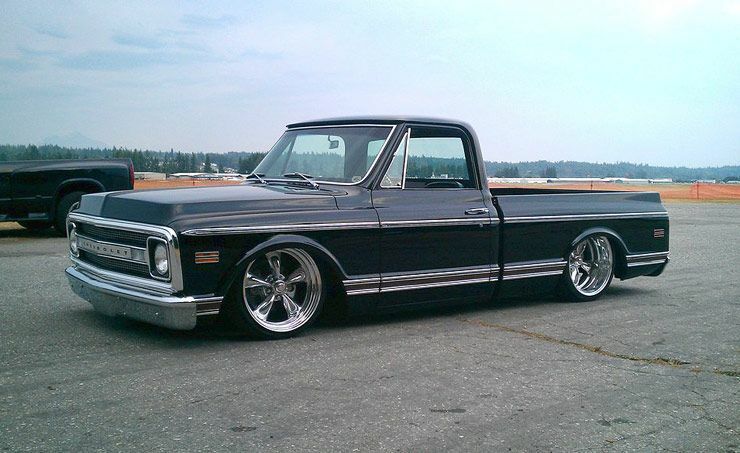 Throughout his childhood his father was a big fan of 1967-72 Chevy C-10s, and he shuffled through several of them. 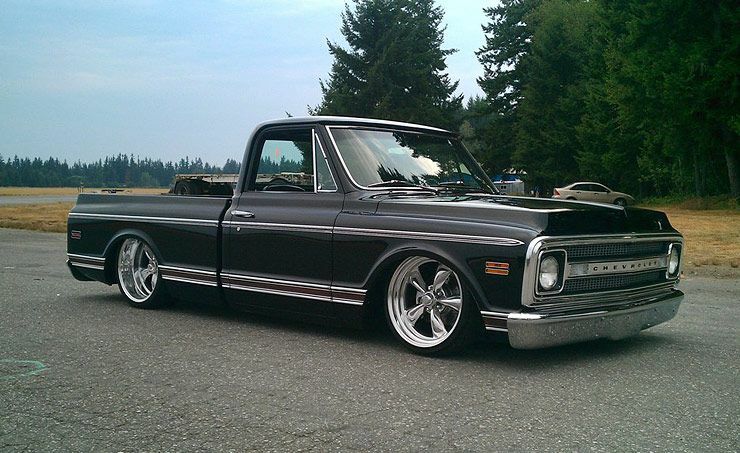 Since his teenaged years, Matt has followed suit by owning several of these C-10s himself. Coming from the Pacific Northwest region of the United States, has a lot of wet weather to deal with, and to help navigate trouble areas, Matt opted for the 4×4 versions of his favorite body-style truck. Recently, Matt decided he wanted a two-wheel-drive C-10 project to restore and modernize that he could drive when the weather is dry. He stumbled across this ’70 CST-10 at Pickett Custom Trucks. 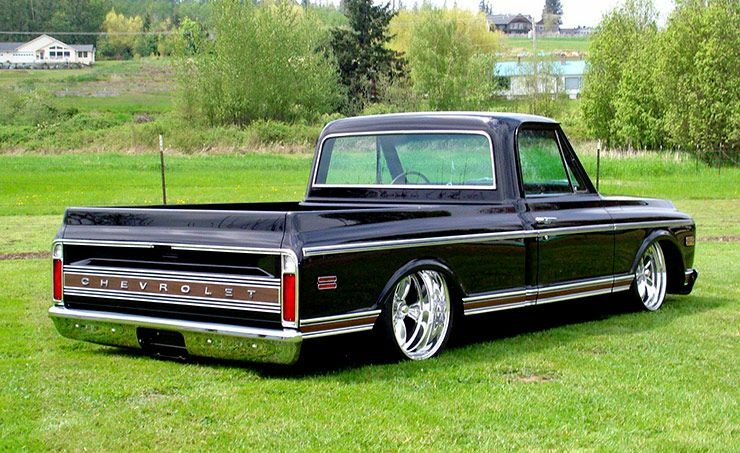 Though the shop is known for customizing semis, and even hosted the TV show Trick My Truck, owner Rod Pickett built this CST as a personal side project. This original short wheelbase C-10 was a special trim level model called CST-10. Rod found it in Georgia complete with black exterior and red interior. Rod set it up to sit super low on an air ride suspension. The stance was set by Z’ing the front frame section so all of the front components would move higher, bringing the front-end lower. Bringing it down further is a set of Belltech dropped spindles. The factory coil springs were ditched and a set of Firestone 2,600-pound airbags were mounted between the frame and the lower control arms. On the tail end the factory 12-bolt rearend was narrowed a total of 6 inches and received a limited slip differential and 4:11:1 gears. The frame was notched so that the rear axle could travel up. A rear 4-link suspension was fabricated in addition to a panhard bar to keep everything in place. Moving the rearend up and down is another set of 2,600-pound Firestone airbags. The suspension was also upgraded with Classic Performance Products disc brakes on all four corners with an ABS electric brake master cylinder. The go capability has been drastically changed as a Chevy 454 big-block was bored and stroked to a 468-ci beast complete with ported and polished heads. Providing a strong dose of air and fuel is a Proform 750-cfm double-pumper carburetor that sits over an Edelbrock Air Gap intake manifold. The wasted gasses are freed through the Hedman block-hugger headers connected to a 2 ½-inch exhaust with Flowmaster mufflers. Transferring power is a turbo-400 transmission with 3,000-stall torque converter and Gear Vendors overdrive. When Matt picked up the truck from Rod it was in decent condition, but it needed a few finishing touches. So, Matt turned to Rich Van Pelt of Hot Wheels Autobody in Clear Lake, Washington. Rich started under the hood, smoothing the firewall, core support and inner fenders. Then the raised steel bed floor was shaved of mounting bolts. Afterwards, the rest of the exterior steel was worked straight and in black from Matrix System Automotive Finishes. Matt wanted to keep the original feel and bought replacement trim pieces from Mar-K. Queen City Chroming in Mukilteo, Washington, revived the original bumpers. Now this classic-styled CST-10 sits hard over a set of 20-inch American Racing Torq Thrust II with Toyo Proxes tires. Matt’s CST-10 is a super clean truck with a few mods to make it cooler than most others. 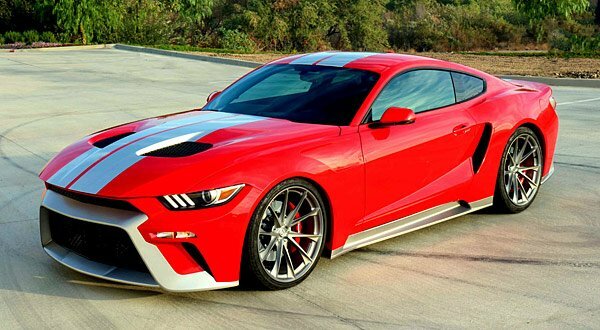 Though it’s not completely wild, it’s done tastefully enough to turn some heads on the road. When he gets the opportunity to cruise it, he can relive some of the fond memories of his childhood.